Notes: Stogursey Castle is a medieval castle in Somerset, England, now used for holiday rental by the Landmark Trust. 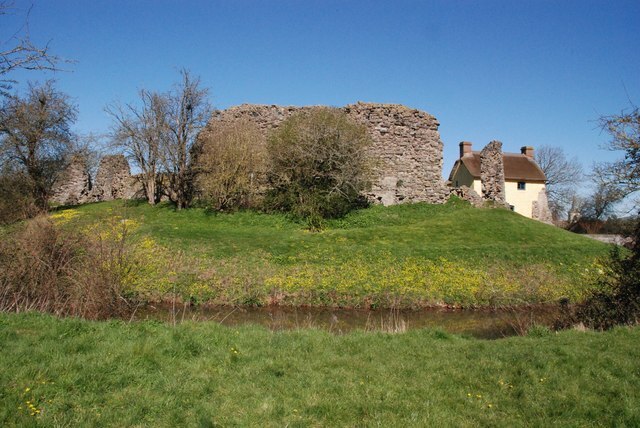 Stogursey Castle was built to the south of the village of Stogursey by the family of the De Courcys, probably in the late 11th or early 12th century. The name Stogursey is a corruption of Stoke Courcy. The castle was a motte-and-bailey design with a 60 metre wide, two metre tall motte and two bailey enclosures, surrounded by a water-filled moat, fed from the nearby Stogursey Brook. The castle was controlled by King John of England during the First Barons' War, and was ordered to be destroyed in 1215, but survived; John's lieutenant Falkes de Breaute took control of the castle, and after his death a second order to destroy the property was given in 1228, again apparently ignored. The castle was extended in stone in 1300 by the Fitzpayne family, but was destroyed in the 1450s by the Yorkist faction during the War of the Roses. A house was built within the castle grounds in the 17th century and was restored in the 1870s, but by the late 20th century had itself become ruined. Storgursey Castle is a Grade II* listed building, and was restored by the Landmark Trust between 1981 and 1982 for use as a holiday let.